Inject personality into your daily styling routine with a pink cropped top and a H&M Straw Hat. Loosen things up and throw in a pair of hot pink athletic shoes. If you feel more confident in comfy clothes, you're bound to fall in love with this relaxed pairing of a yellow gingham dress shirt and a H&M khaki straw hat. A light blue denim vest and a H&M Straw Hat are the kind of a foolproof casual getup that you so desperately need when you have no time to pick out a look. Switch up your outfit with a classier kind of shoes, such as these aquamarine low top sneakers. For an outfit that provides function and chicness, consider wearing a light blue polka dot tank dress and a khaki straw hat. For a dressier vibe, why not introduce a pair of white fringe leather flat sandals to the mix? This casual pairing of a light blue blazer and a H&M Straw Hat from H & M is clean, seriously chic and super easy to copy! Let's make a bit more effort now and complement your look with a pair of white leather loafers. 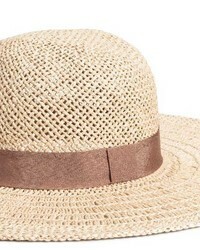 A white eyelet cropped top and a H&M Straw Hat are a cool combination to keep in your casual sartorial collection. For a casual ensemble with a modern finish, go for a grey vertical striped jumpsuit and a H&M khaki straw hat. Our favorite of a countless number of ways to finish off this getup is silver leather flat sandals. A pink blazer and a H&M Straw Hat are a nice combo to have in your day-to-day casual wardrobe. A pair of silver leather pumps instantly glams up any ensemble. For a cool and relaxed ensemble, team a white crew-neck t-shirt with a H&M khaki straw hat — these items play perfectly well together. Give this outfit an extra touch of sophistication by slipping into white canvas low top sneakers.